Geography is the study of the environment, humans and the relationship between them. In an increasingly strained world this understanding forms the foundation for a wide range of career destinations and facilitates entry into a diverse range of tertiary courses. This course draws on student knowledge of the world, imagination, values, creativity and the ability to problem solve. The course consists of two units with mapping and practical skills integrated at all points of study. Geography encourages students to understand environmental impact on humans and how we respond. This unit focuses on Natural and Ecological Hazards that threaten human life, health, economy and habitat. Students focus on understanding how these hazards and their associated risks are perceived and managed at local, regional and global levels. 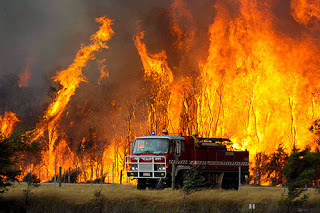 Students explore natural hazards, this may include atmospheric, hydrological or geomorphic hazards, for example, storms, cyclones, tornadoes, frosts, droughts, bushfires, flooding, earthquakes, volcanoes and landslides. They will also explore ecological hazards, for example, environmental diseases/pandemics (toxin-based respiratory ailments, infectious diseases, animal-transmitted diseases and water-borne diseases) and plant and animal invasions. Students will look at the impacts of one natural and one ecological hazard in depth, including the nature of the human response. In this process they will consider Disaster Planning and Mitigation, and, how effective this can be. In this unit, students explore the economic and cultural transformations taking place in the world – the spatial outcomes of these processes and their social and geopolitical consequences – that will enable them to better understand the dynamic nature of the world in which they live. This is a world in which advances in transport and telecommunications technologies have not only transformed global patterns of production and consumption but also facilitated the diffusion of ideas and elements of cultures. The unit explains how these advances in transport and communication technology have lessened the friction of distance and have impacted at a range of local, national and global scales. Cultural groups that may have been isolated in the early twentieth century are now linked across an interconnected world in which there is a ‘shrinking’ of time and space. Of particular interest are the ways in which people adapt and respond to these changes. Students explore the changes taking place in the spatial distribution of the production and consumption of a selected commodity, good or service and the study of an example of cultural diffusion, adoption and adaptation. They also investigate the ways people embrace, adapt to, or resist the forces of international integration. As an ATAR course each semester will have an exam. Frequent assessment with online resourcing and feedback are part of the assessment structure. Students need to consider that this course includes a fieldwork component, which will include excursions and /or concert event (e.g. international artist). Students develop a range of skills that help them to understand the physical world, interpret the past, scrutinise the present, and explore sustainable strategies for the future care of places. The skills developed by Geography students are an integral part of future growth areas in the global economy. Career pathways include: Environmental Scientists, Environmental Engineers (biological or chemical), Urban Planners, Geographers/mapping technicians (including GIS specialists), Atmospheric scientists, Hydrologists, Petroleum Engineers, Geoscientists, Surveyors, Sociologists, Business Analysts and many more.